I was thinking about this because I was here in my office writing away and had a thought about what I'm working on that I realized was probably something that no one had ever really thought before. Nothing particularly profound, nor even necessarily correct (I'll need to think about it more tomorrow). But that the things I was working with were such a motley and intellectual-biography-contingent collection of things that no one else would ever have reason to put them together. Anyway, it's not like I've never thought anything that, to my knowledge, nobody has ever thought before, per se, but my usual conclusion from that is that it's more or less something that has been thought before and I'm just rediscovering it unwittingly or otherwise, with perhaps a new coat of paint particular to whatever issue I'm working on. Like how there are only really like 11 plots of novels, or how I only really have like 17 different funny things to say--total, lifetime--but spring them on people in different guises. In any case, it's an magical thing about this academic world that you can read an eclectic bunch of things and put yourself in a position where you feel like you are thinking about something that nobody has ever really thought about before; even more that you can reflect and conclude the feeling is probably correct, at least in terms of particulars, rather than delusional. It's like the boy detective gets to feel like he's an explorer, without having to leave his office or risk malaria or scurvy. That said, I should really leave my office and go to bed. I have been trying a nocturnal gambit while I work on this paper. Still, it's past 3 and I'm still in my office, feeling slaphappy and blogging, both of which are good indicators that it's time to go home. Update, next day: As I expected, upon further reflection, neither so new nor so clever. Eszter has started this thing where she is going to post a photo of something-from-her-life every day for a year. She's on Day 3, so just shy of the 1% of way there. She tried to get me to do it, too, even enticing me with a picture of the Boy Detective sporting black and gold. My reaction: I can't even manage to shave every day, how am I supposed to manage to remember to keep my camera with me and take a photo of something every day? In general, I am not very good at the concept of "every day," a principal part of my more general difficulty with that great secret to high human productivity, the "routine." Although I do admit the idea is appealing. I think I also don't like the arbitrariness of doing it from a random day in October/November that same day one year hence. Presuming that Eszter is still going strong, I might join the project on January 1. If I do, you should, too. (Yes, I mean you.) If I do, I don't think I'd write the full descriptions of the photo that Eszter does, but rather just snap something quirky and give a couple of lines. I was so excited I ordered two. But then I got an e-mail from them saying it was out of stock and that they had it in red-and-gray. I told them that I had an immutable color preference and asked if they could give me the manufacturer's name so I could try to track it down. Being Angry, Young, and Poor, they didn't write me back. I hope they stay poor and age rapidly and ungracefully. Meanwhile, on the self-motivation front, I downloaded the cover image from The Boy Detective Fails, photoshopped out the "Fails" and the author's name, printed it out, and have tacked it to my bulletin board. I should color in his tie black and gold. Meanwhile: I've declared that this boy detective is grounded until he makes real progress on the paper he's working on. I'm incorrigibly bad about being the boss of me, but time is getting tight and this wandery child needs to be brought to heel, or he's stands no chance of cracking The Case of the Embodied Explanans. "Had I turned and had it hit me in the eye, it would have killed me," Bowden said. "It was glass. That's what scared me. Those plastic ones, it wouldn't go that far." Bowden said he gave the bottle to Clemson athletic director Terry Don Phillips, who was standing on the sideline. Bowden said officials made an announcement warning fans not to throw objects on the field. "I really was afraid after that because had I turned and been hit in the eye, I surely would have lost the eye," Bowden said. In any case, even though college football coaches get paid roughly two orders of magnitude more than college professors, at least we don't have people throwing glass bottles at us while we are doing our job. "If you want to hate me, cool, hate me," Federline, 28, says in an interview posted Thursday on People magazine's Web site. "You know why? Because all it's going to do is help me." I don't really follow popular culture, so I don't know who this guy "K-Fed" is other than he's married to Britney Spears, but I am from the Midwest and one thing about Midwesterners is that when people need your help, you help, even if they are strangers. I was really pleased a few days when I pondered about it and realized I did not actually hate anyone, but I guess I am willing to go back on my hateless existence if it will give this young fellow a hand. Although, it's not clear: does he think it's helpful to be hated by everyone, or only to be hated by people who want to hate him. If the latter, I supposed that's my Get Out Of Hate Free card to pass on offering assistance. Besides, mine is not really a hateless existence anyway, as there's always SPSS. Update! : A commenter reminds me that I also hate war criminals. Add coconut to the list as well. So, in sum and in order: (1) SPSS, (2) war criminals, (3) coconut, and (4, if I must) "K-Fed". According to the folklore, one of the most celebrated sociologists of the era got "caught with his pants down" in an up-close ethnography of prostitution; the university administration and the Chicago Tribune demanded that he be fired. This tale is a more colorful illustration of Chicago researchers' committment to studying deviance in its natural settings. Does anyone know who this is about, and what the story is? * Regarding my last post, one can read this address and get a sense of how many sociologists think about the seemliness of any kind of effort toward even modest constructively-minded engagement between sociology and genetics. Update: Someone who would know confirmed for me that the person referred to is W.I. Thomas. Do not expect much from this blog for awhile. I'm sort of engrossed in a few things, including needing to clear out my basement storage bin so asbestos removal can begin. The more engrossing thing, though, is that I am working on a paper for an November 15 deadline, and it's been slow going. I feel sort of like a tangled cognitive kite stuck in a very tall tree. I'm not sure if I am going to be able to pull this off or not; it's certainly going to require the boy detective to step up his game. Regardless, the thing with this paper is: if it fails, it will either end up a word puddle that's never quite finished or something that gets serially rejected from journals until I find some gentle hideaway outlet for it. But if it succeeds, it may well ruin my career in sociology. Why do I not walk away from this? I do not know. Or, to whatever extent I do, the theory varies from day to day. Part of it is a conviction that I am right, but that is hardly a sufficient explanation for academic action. On an all-too-related note, I am giving a talk at another university in a couple of weeks. Because this paper is the main thing I'm working on between now and then, and because I'm not really excited to take one of my old talks and do the refreshing and tweaking work to buff it up for this purpose, I will be giving a talk on this paper. I waited until the third time I was asked to send the title. But, lo, posters are being made or whatever for this guy Freese to give a talk called "Brave New (end of the) World (as we know it): Genetics and the Future of Analytic Social Science." So, not having television or ever living in a particularly competitive campaign district for the whole of my life, I haven't closely tracked the descent of televised political ads into the cesspool of the ugliest parts of the human spirit, but have you seen this ad running in Tennessee against Harold Ford? Wow. Wow. The above being a verbatim quote from a phone conversation this evening with a old friend of mine. Back in the day, she could be relied upon to take the unyielding radical environmentalist position whenever someone would talk about the possible importance of genetics for the determination of something. Now, she's in the position of choosing an anonymous donor to father her baby. She has spent a few thousand hours poring over the profiles of different prospects. In the end, she decided to shell out extra so she can get the sperm of someone who is "in a professional school." "What kind of professional school?" "Pharmacy? Pharmacy school counts for a sperm price premium?" "Darling, pharmacy school is more difficult than anything you've ever done." The other thing that was a big selling point for the donor was this photo of him from when he was a child. She e-mailed it to me; he is a cute kid, in a shifty, precocious-sociopath sort of way. He's standing at this toy lectern with an apple on it and this fake-o painted background of books behind him. Poseur. I'm presuming that when his mother took him to K-Mart to get it taken, she had little idea of how consequential that day was to her evolutionary fitness. "I think you should pick someone with blue eyes." "You think I should make it a sure thing I get someone with blue eyes." "I think this guy doesn't look likely to have a blue-eyed recessive gene in him, so it's not far from a sure thing for brown eyes." "You advocate for the propagation of blue eyes." "Natural blue eyes are on their way to extinction. I just think so long as you are picking daddy out of a database, you could do your part to postpone the inevitable." A common cocktail party topic for academics is what job they would fancy doing if they weren't academics. My stock answer for what I would do if I was cast out of academia, "Write a lurid murder mystery about academia," still holds, and I continue to collect anecdotes that might be good fodder for that exigency should it arise (feel free to e-mail me; the truth value of particular anecdotes is not as pertinent for my purposes as its lurid novelization value). The more common way of asking the question, though, is just to imagine your fantasized alternative career--sometimes phrased as what you really want to be when you grow up--and for this I have cycled noncommittally through various answers. 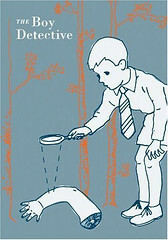 This weekend, though, I read the novel The Boy Detective Fails (recipient of a rare 5 kiwi rating on Lucy's blog) and have decided that this is really what I want to be when I grow up: Jeremy Freese, boy detective. Indeed, given the adage that the best way to become something is to pretend to be it already, it's all I can do not to make a WWJF,BDD bracelet for myself, or to change my signature file and business cards to add this along with the "associate professor" and "policy fellow" titles. I think it's long been the case that the times I enjoy social research the most are those where I feel like Jeremy Freese, boy detective, so at least I can be more honest with myself about this fact and perhaps also take up solving crimes on the side. I was telling a friend excitedly all about this while we were walking on the bricks, cement, and iron subway grates of Massachusetts Avenue between Harvard and Central Squares. Suddenly there was this really loud noise like a train. "What's that thing that sounds like a train?" I said, looking around perplexed, since it's not like there were any railroad crossings near where we were walking. Then I added: "Oh, uh, it's the subway," which was, at that moment, directly beneath us. 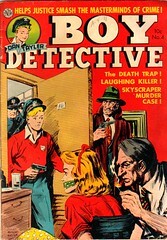 "Nice work, boy detective," said my friend. The room was still as the boy detective took the magnifying glass in his hand and began to do what he had always been meant to. At once, the mysterious, the unknown, and the unidentified moved from the shadows into sharp contrast before his eyes. It was at that moment that the boy detective first began to detect. It went exactly like this: Billy held up the magnifying glass, the lens bringing the wondering faces of his family into perfect sharpness, their soft expressions suddenly becoming serious, each a portrait of some hidden secret. Billy spied his older brother with the magnifying glass, as he was the relative standing the closest, and Derek immediately confessed that he was gay. Also, that he hated life in the Navy. The book also features a brainy girl who is intimidated out of participating in the science fair by a popular girl who goes on to win with the project "How Water Totally Turns Into Ice." It's not like I was out gallivanting to all hours. Instead, it's just me doing some reading, incidental fretting, googlestalking people from my past and hanging out with the lifelong bane of my existence, insomnia. Ugh. Not being able to sleep makes it exceedingly difficult to settle into or maintain routines. Plus, it tends to make me some combination of morose and cranky. All you who are blissfully asleep as I type this, I covet your sweet dreams. So, as noted in my comments, there is now a Wiki available for different issues on sociology graduate students. I think this is a great idea generally, and hope it succeeds. And yet: while I freely admit that I have not read the specific information cited regarding Getting A Job (and don't plan to), I'm leery of the idea in principle of using the Wiki format to get information on how the job market "really works." My usual first piece of advice for people who are trying to get information about the job market, either in the abstract or about their own candidacy specifically, is that they should get advice from multiple people and do some weighted triangulation based on the combination of (1) the seeming soundness of the reasoning provided for the advice and the (2) extent to which the person providing the advice seems like they would actually be in a position to know. * This is because opinions about the job market vary considerably even among people one would think would be veridical sources of knowledge. So, I think any time somebody makes an assertion about the job market, one should consider the source. The Wiki format is much better suited to topics in which there is more consensus and so anonymized discussions make more sense. So, I guess, it's fine if one reads a Wiki about getting a job, but I wouldn't take it too seriously, just like I would talk to a number of different people, and not view any one person's views as the end-all. I do think there could be more done to circulate good information about what the broad range of departmental employers are looking for to students on the market. What I especially mean by good information is information from the people in the best positions to know: those who have served repeatedly on personnel committees at schools that are not in the top 20 or so graduate programs. As a non sequitur, I hereby declare myself to be officially tired of hearing about the weird meme that has been circulating at least among Wisconsin students the past couple years that female candidates should not wear black on job interviews or else negative judgments will be made about their character (or whatever). I have no idea where this originated, or about how mutated its re-statements are from whatever its origin is/was. I want to state for the online record that my personal opinion is that this advice is silly and that, while candidates should dress professionally, obsessing about the color of one's outfits is not a good use of cognitive energy. As ever, my views are open to revision in the face of actual good reasons, should these materialize. But the job market is neurosis-inducing enough without stirring in implausible microagitating hearsay noise. * Note that I expressed some stridency of opinion in the last post, but this was mostly about how job searches at Wisconsin work--about which I am much more confident I know what I'm talking about. So, anyway, the answer is no, having tenure is not overrated. Regardless of whatever ways having tenure does not mean having a guaranteed job for life, it still means having a job for now. Those who are sending out dozens of applications, crafting job talks, and laying awake at night wondering if you are going to end up working the buffet at Sizzler instead of a faculty job, you have my sympathies. I do not at all envy your situation, although perhaps your youth. As penance for my Coke Zero consumption, I have started making myself enter the codes for the MyCokeRewards program. Estimates of the value of each bottlecap vary, but suffice it to say that few models of the value of my time would indicate that it is worthwhile for me to be entering them, especially given (1) that I'm not even sure which of the available rewards I would want and (2) that I just throw the bottles themselves in a recycling bin, even though I could be earning a nickel a pop (ha! midwestern pun!) by bagging and returning them here in Massachusetts. Anyway, at the high end of the rewards scale are things like the "Train Like An Olympian" above, which is available for 25000 points. I drink 20 ounce bottles, whose caps are worth 3 points each. So one needs 8334 of these caps in order to be able to train like an Olympian. Luckily I'm drinking Coke Zero with all its eventually-will-be-revealed-as-toxic aspartame* goodness, as if I were drinking regular Coke each 20 ounce bottle would be 250 calories. So training like an Olympian would require pre-training by consuming 2,083,500 calories of Coca-Cola, which, in the context of an otherwise weight-neutral lifestyle, implies a gain of approximately 595 pounds. I'm not somebody who normally saves and uses frequent purchaser cards or anything like that, so it's completely mysterious why I have been entering these Coke Rewards codes about which it's unclear if and when I would ever cash them in for anything. I think the absurdity of it is part of what propels me forward, which I think says something about me, although I'm not exactly sure what but suspect it's not flattering. * BTW, I've always presume it's pronounced AZ-per-tame, but some people I know say uh-SPAR-tuh-may with confident panache. Anyone know which it is? Nice crisp sunny day yesterday in Cambridge. I am housed in the Center for Government and International Studies, which has two buildings on opposite sides of the street. These are often referred to as the North and South buildings, although technically their names are Knafel and South, because someone has donated enough for naming rights for the North building but no one has claimed the South one yet. I was walking from South to North today when I hurried looking student ran up to me and asked, "Which of these buildings is North?" I pointed at my shadow on the ground and then extended my arm upward and said, "North." He took my answer, but I'm not sure he understood the unstated generalization I was trying to convey. Then again, rights to naming the South building will be bought by someone who's last name is North (or, given Knafel is the name of the other building, Knorth). Bob Herbert's NYT column today is title "WHY AREN'T WE SHOCKED?" His leadoff example is a Abercrombie and Fitch T-Shirt for young women that says "Who needs a brain when you have these?" The actual T-Shirt, as far as I can tell online, is "Who needs brains when you have these?" I'm trying to decide if this difference is trivial or substantial. Thoughts? I still use my University of Wisconsin account for my professional e-mail. UW's e-mail is filtered for spam by this system known as SpamAssassin, which purportedly uses a "Bayesian" process to learn what messages are spam and improves performance accordingly. Lately SpamAssassin is going through some Flowers-For-Algerspam re-retardation phase, as it has unlearned that the appearance of various lewd phrases or pharmaceuticals in subject lines is a strong indicator of the message being unwanted in my inbox. I hope SpamAssassin is just failing to filter messages and isn't being like the assassin in A Fish Called Wanda: every time a spam message is sent to me, the program let's it go through, but accidentally kills a dog instead. If true, then at the current rate, canines will be extinct from the planet by the middle of next month, so get your glamour shots taken with Rover now. Presumably Apple is thinking that they will be able to make more than enough money when they finally break the color barrier with their regular iPods that they don't need to dilute the profits from the opportunity with a help-the-dying tie-in. It would be easy to make snarky comments about Project(RED), but they will have to be made by someone else since if there was a (red) iPod, I would probably buy it. * Still, one does pine for a Project(GREEN) that features knockoffs of the premium brands that are participating in Project(RED), where on the sales tag they list how much you are saving over buying the premium brand and urge you to send that amount directly to a charity for AIDS in Africa. Market-based probabilities for the past month of Republicans retaining control of the House of Representatives. 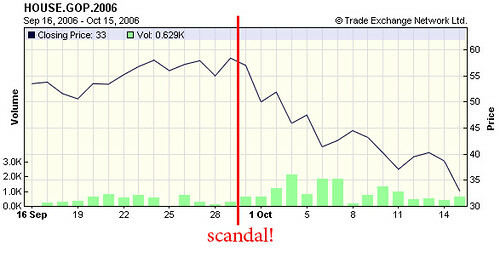 ("Price" on the right hand side is the probability, so Republicans have gone from having about a 60% chance before the Foley scandal to now less than 35% after the scandal. Via Tradesports.) As ever, the market-based probability is either a better guess than one's own at the true probability, or it is a chance for one to make money. who's afraid of virginia woolfenstein? So, I don't really play computer games, but the Atlantic has a story this month on a "game" called Façade that is an effort to create an "interactive drama." The premise of the game is that you are invited over to the apartment of a couple of friends, Grace and Trip, and you show up at At A Bad Time. A disagreement between them ensues. You get to pick up objects, sip on a drink that Trip makes you, and engage in various benign displays of affection with either of your hosts. More importantly, your typing things represents you saying them. Because Grace and Trip are actually talking, by which I mean the game plays audio clips, it's not like chatterbots (such as A.L.I.C.E.) where the game's AI has ways of reformatting things you say in its response. But some things you say do elicit responses (the characters also direct "yes or no" questions to you at various times during the scene). Like many attempts at AI conversation, the resulting "realism" ends up depending much on how the computer responds when its parser had no idea what you are trying to say, and here the setting makes sense. Because Grace and Trip are arguing, when you say something the game doesn't understand, they will just carry forward their dispute in one way or another. The downside: who really wants to play a game that is based on watching married people fight? I get enough of that at family holidays. If you play the game straight--trying to imagine what you would actually say if in the situation the game presents--you play most of it trying to figure out nice ways of either excusing yourself or changing the subject. Apparently, the creators of Facade are working on a new game that will be based on a party. Again, another setting that makes sense because if the computer doesn't understand you it's easy to just have the characters act as if their intention is to ignore you and just talk to one another. And, better comedic value than a fighting couple. Still, I thought an even better premise for both comedy and protagonist-ignoring-cross-talk would be to have the player be the student at a dissertation defense. Update: Lucy tries Facade, and has her own problems. "In 1951, just over 2 percent of the pages ... the American Economic Review, contained an equation." BTW, for those who think I only complain about sociology, the MacKenzie book is marvelous. It's a case study of the effect of academic economics on the economy (more specifically, on finance, or more specifically still, on the creation and operation of options markets). I suppose it could be good as a discussion for how the people who do attend can best persuade those who wouldn't attend something like this that the death penalty is wrong. Anyway, the authors of this study asked the authors of 141 papers that appeared in American Psychological Association journals for the data from their papers for the purposes of re-analysis. 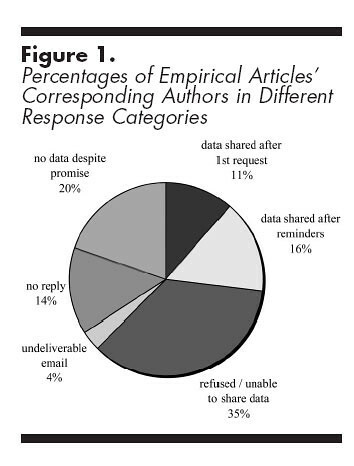 * Only 27% ended up providing their data after repeated requests from the authors. Put another way, 73% of what you read as findings in the most esteemed journals in psychology are not available for independent verification by others. Does someone really have to go and do a study like this for sociology for it to be believed that this is also a problem in our discipline? Things here have, let's just say, gotten a bit out of hand. 'Tis not helping that I've lately been either traveling or having deep troubles with the lifelong bane of my existence, sleep. It's my advisor's birthday today. I would refer to him by some past-implicative term like "dissertation advisor" if I didn't still regularly call him for advice. A phrase that I picked up from him and have since plagiaristically repeated when talking to graduate students is that "all advisors have their strengths and their weaknesses." My advisor's main weakness from my standpoint is that our sociology interests really don't overlap that much, which is not exactly something I can blame him for. Meanwhile, one of my advisor's great strengths is a great strength to have in an advisor: he's as good as anyone I have ever known at giving advice. The main parts of this skill are having a good strategic mind and being able to articulate that reasoning well, but another part is being able to do so with conviction. Me, even when I feel like I have useful advice to give, I often provide it very tentatively, like I'm afraid the person will actually take it because then I'll feel responsible and guilty if things don't work out. Here. Apparently, on its way to humanised mice, the yellow brick road now also crosses the equator. Lions and tigers and bears, crikey! A number of mid-level Democratic operatives--the kind who could expect a good job in any Democratic administration--told me they didn't believe [Hillary Clinton] could win a general election, especially against a popular Republican like McCain. But at the same time, they did not entertain the possibility of working for another Democratic candidate. "It's simple, really," one of them explained to me. "Bill Clinton made my career--I wouldn't be who I am, in the job I'm in, if he hadn't made me. There's no way I could ever work against Hillary." He was conflicted about this, as are many others. It sounded as though he and his colleagues would rather cede the race than work against Bill Clinton's wife. On personal fronts, today has largely been taken up by a self-declared SLURP (Squalid Lifestyle Urgent Reduction Program). I did have a surprisingly strong run of my Standard Shorter Loop, as Sal e-mailed to taunt whether I would be ready for our half marathon in Tulsa the weekend before Thanksgiving. One thing I learned from my recent trip to Penn State was that, like the University of Wisconsin, the university makes ice cream that is highly regarded by locals. I had a scoop of the Penn State vanilla--the accepted apples-to-apples comparator in the ice cream domain--and Penn State's was better, although it was better by tasting more like custard than ice cream, so maybe they are playing fast-and-loose with food labeling. (N.B. : One friend who has spent time in both places thinks that Madison's ice cream is better, although I think her reasons focused on Madison doing more and more unrestrained flavors.) Anyway, I mention this here because that scoop of Penn State ice cream is the last ice cream I am having between now and the Tulsa run. I am thinking of writing a $1000 check to the Republican National Committee, to be sent off by a conservative friend should I break this vow. * I'm not linking to the story because I read it in, whatchamacallit, print, and I don't know if it is available online (and am too lazy to look). As reading things online continues to claim an increasing share of my recreational reading, I'm down to only two print magazine subscriptions, the other one being The New Yorker. Oh, and Contexts. I gave my talk today unshaven and in my shortsleeve shirt and jeans. The talk was a comment on a paper about evolution, and I made some comment about my luggage not having evolved enough to understand that the shortest path from Boston to State College was connecting through Kentucky. Every other male who spoke wore a jacket and most wore ties, and I hadn't planned for or packed either, so perhaps it is just as well that rather than being somewhat underdressed I raced to the bottom and wore the clothes that had adorned me through a long travel day the day before. If you are going to dress down, dress down to the ground, Rogaine. The talk went okay. I did the thing where I talk too fast, but the coherent version of that habit, not the incoherent version where I am mostly just a frustrated twitchy word puddle by the end. My luggage had not arrived after my talk but did arrive after I returned from dinner. Hooray, shouts a collective olfactory chorus. Penn State's campus is pretty, but the Nittany Lion Inn has the most confusing layout of any small hotel I have ever been to in my life. It reminded me of being stuck in some "You are in maze, with twisty passages all alike" computer adventure game when I was a kid, where you just wander around without even the aspiration of forming a mental map of the place. The hotel staff are all college students who are almost unsettlingly nice, which undermines my belief that Midwesterners are the most authentically well-meaning people in the country, and would yours as well if you weren't one of those people who thinks Pennsylvania is part of the Midwest. I dressed down to go to the airport. Consistent with the cosmic laws for such things, my luggage has been lost. State College being what it is, the earliest it could possibly get here (i.e., the next Delta flight in) happens to be exactly the time when I will be speaking. The clerk at the hotel was nice enough to offer me a disposable razor. I was going to accept, until it occurred to me that given that I am uncoordinated and it has been roughly two decades since I shaved with a non-electric razor, I would probably slice up my face and bleed to death on my bathroom floor. My original plan had been going to be to head straight to my hotel room and work on the slides to my talk. Instead, I went straight to the hotel bar. the Cincinnati airport, which is not in Ohio but northern Kentucky. me working on my laptop when there is turbulence. can and (2) once again, my new Treo rocks. Update, immediately thereafter: The relevance of my wanting to confirm that I can blog from my Treo will be clear soon. Stay tuned. BTW, last week I went to the Galleria with someone who was interested in buying a Treo or one of its competitors. The main thing was he wanted everything together, so he was looking for something not just a phone and organizer and camera, but also an MP3 player, and a backmassager, and, in a pinch, a defibrilator. "So, do you use an all-in-one shampoo and conditioner?" I asked him. "Do you own a hybrid bike? Did you do a mixed-methods master's thesis?" I think the point of my questions was lost, which was perhaps just as well. Update: As alerted to me by Kim, a fuller Foley transcript is available at Slate here. It's so completely creeptastic I couldn't bear to read it after page four. Recently I described myself to someone as "highly locally autocorrelated." By this, I meant that I--well, first, in putting it this way, I meant that I'm a dork. Beyond this, though, in saying that I'm "highly autocorrelated" I mean that there is often an unusually high correlation between my preferences in one moment and my preferences the next moment. Most people, they really enjoy something for lunch, and maybe they will start having it two or three times a week. Me, I really enjoy something for lunch, and, if left to my cravings, I'll have it for the next thirty consecutive meals. In saying this a "local" phenomenon, I'm just saying that specific attachments are episodic rather than lifelong. I am a creature of serial ephemeral obsessions. Nowhere is this more plain than with music. I often work with my door closed. I say this is because I like to listen to music while I work, and I prefer to use the speakers rather than headphones given how peripatetic I am. Sometimes, I will also confess that I also don't want people to overhear what music I am listening to and judge my undiscerning tastes. What I don't admit is that it's not so much that I'm afraid people will judge me ill for the particular songs I listen to, but that people will judge me a complete freakazoid for the way I listen to particular songs over and over again. Yes, I have listened to this song 131 times in the last 14 days. That alone has to propel me into some DSM diagnostic bonus round. * "She's got one magic trick / Just one and that's it." If you want to know what the trick is, you can buy the song for a dollar at iTunes. I suppose if you don't want to spend the dollar and are the sort who would listen to it in good faith that you would buy more of M. Ward's music if you liked it, you can e-mail me. However: I will not send you the Chipmunks song even if you beg.